Okay, I had no memory of ever having seen this, but it was very familiar by the end, which makes me think I must have seen it at some point. In the annals of Christmas TV Specials, there’s a reason this one doesn’t make the list of classics. However, there are bits that are clever, and it’s nice and short. The special opens by introducing us to our villain, Alexander Graham Wolf, aka Big Bad. He’s got some sort of weird plan involving the North Pole and Santa, and it’s all very unclear. It’s clear enough, though, to reindeer Comet, who zips off for reinforcements to save Christmas. Since she can’t carry anything too heavy, Comet chooses two rag dolls and a rag doll dog for her helpers. Not the smartest member of the team, our Comet. I think this is a good time to mention that the animation is Chuck Jones, and you can tell. The movement is so smooth, and the style is inventive and expressive in the best ways. So, the (cleverly designed and animated) machine is for snatching toys and encasing them in unbreakable clear stuff called Gloopstick, that will protect them from breaking (or being played with) FOREVER. Plus Wolf-guy is excited that he’s going to make a mint selling the licensing on this product, already stuck to most of the Christmas toys. After he fails to convince Ann and Andy of the brilliance of Gloopstick (Andy actually goes along with it when the example toy is a doll, only to change his tune once it’s a bike) the Wolf tries to capture them in his machine. After some chasing and cleverness, Andy gets the Wolf Gloopsticked and bedazzled. But, oh no! Arthur (Ann and Andy’s dog) is trapped as well. But it’s all going to be okay, because Ann and Andy discover that something can dissolve the Gloopstick. It’s industrial solvent. They’ll have to work all night, but Christmas will still happen on time! No, I’m kidding. It’s love. 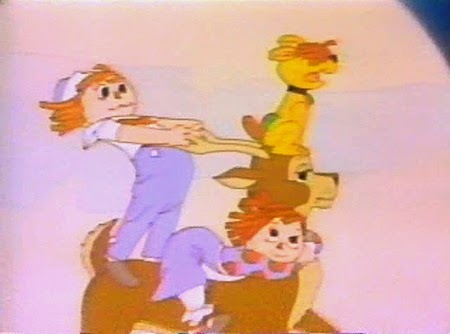 So Raggedy Ann and Andy break the fourth wall and ask the kids at home to love all the toys and then even give love to the Wolf to get them all free of the Gloopstick. It’s kind of a nice little redemption story, where the Wolf mourns his folly and agrees to try to be a Big Good Wolf. So, Merry Christmas, boys and girls. Make sure you make time for some badness before next holiday season comes around.